The last week and a half have been quite busy for Cabot Oil & Gas Corporation in the Susquehanna County community. Our employees and business partners have volunteered at a number of events from Hop Bottom to Montrose, Pa.
Cabot believes that we are more than just a neighbor in Susquehanna County. Participation at events like the ones we recently visited (see below) ensures that we are a true member of the community. Below is a detailed description of each event. We recently visited the Pennsylvania Championship Stockdog Trial, which aims to test competitive ranch and farm dogs on herding skills. For the second straight year, Cabot has proudly sponsored this growing sport in the dog world. This five-day event, in its 31st year, brings competitors from all of the United States and Canada to Susquehanna County to “test the team effort between handlers and dogs while out-guessing and out-thinking sheep through an obstacle course,” Co-organizer Cheryl Williams, said. In all, more than 300 dogs and their handlers participated in the event, with many of the top performers qualifying for the United States Border Collie Handlers Association. The event, which drew hundreds of spectators, allowed Cabot the opportunity to engage with community members and travelers who were eager to learn about the industry. At our booth, we fielded questions about the drilling process, the safety of our operations and about our work in the community. Cabot, in partnership with Williams, hosted approximately 20 high school students from the region, all of whom volunteered for this one-week summer program through Wallenpaupack. By pairing industry leaders with students and educators, the program helps students recognize the growing importance of domestic energy in this country. Many of the students were impressed with the multiple career possibilities that await them in the natural gas industry. During the camp, students learned about Cathartic Protection; a simple scientific process which utilizes electricity to prevent corrosion of underground pipelines. 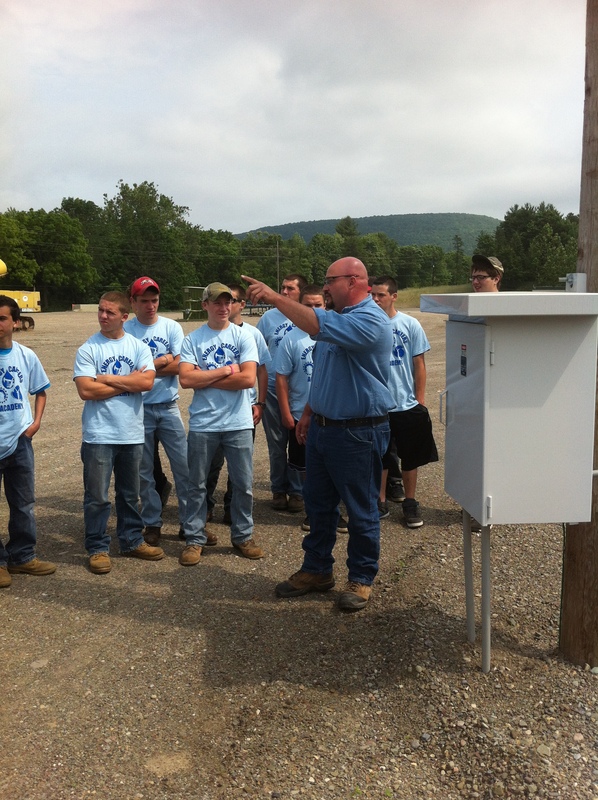 Students also saw the importance of skilled welders and the intricacies of compressor stations. Up the road in Springville, Pa., the group toured a completed well site, waste water recycling plant and Cabot’s very own CNG fueling station. While these students still have a few years to decide what career path to take, broad exposure to the natural gas industry clearly opened every student’s mind to new and exciting careers. Cancer is a disease that seemingly affects everyone, directly or indirectly, through our family and friends. 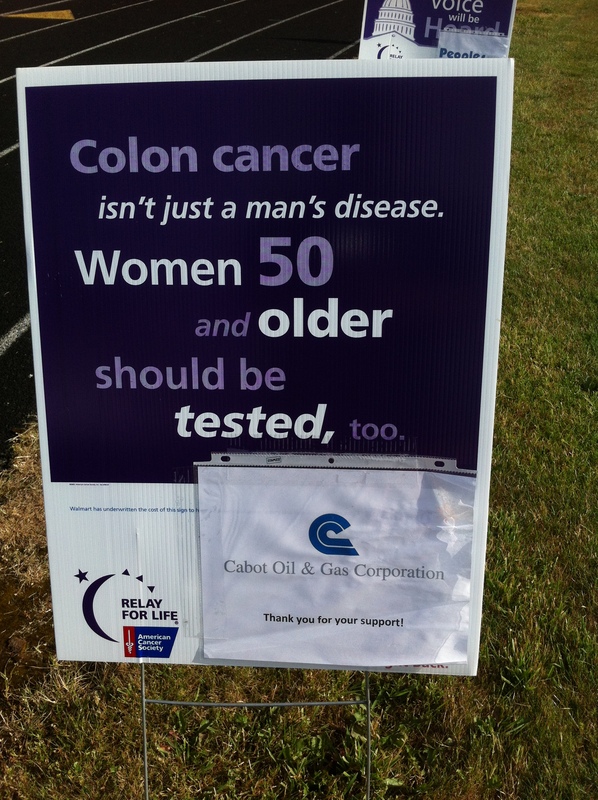 Because of this, Cabot employees found an opportunity to donate to and volunteer for Cancer research. At this year’s Relay-for –Life, held at Montrose High School, hundreds of people came out to support Cancer research while enjoying food and entertainment. Cabot employees participated in the 24-hour walk to symbolize the journey that Cancer-sufferers undergo. We also distributed Frisbees to Relay walkers and participants to provide an added activity to children and families during the long event and shared information about our upcoming Community Picnic in Harford, Pa. Many spectators gathered to admire the CNG vehicle and many equated the vehicle to the next development in American energy independence. 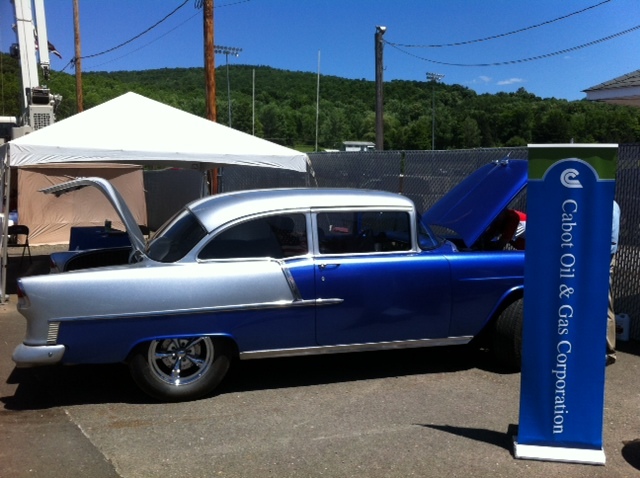 “The entire conversion project cost only $1,800 and a weekend of labor,” Mike Faillace, the Chevrolet’s owner, said. It is Cabot’s sincere wish that more will recognize the practicality of converting to CNG-powered vehicles. We’re always looking for more ways to get involved in the community. If you’re interested in the events that we currently sponsor or participate in, we encourage you to visit our Community Calendar and read our blog regularly for updates. If you have an event that you would like us to stop by at, send us an email.